Yay! 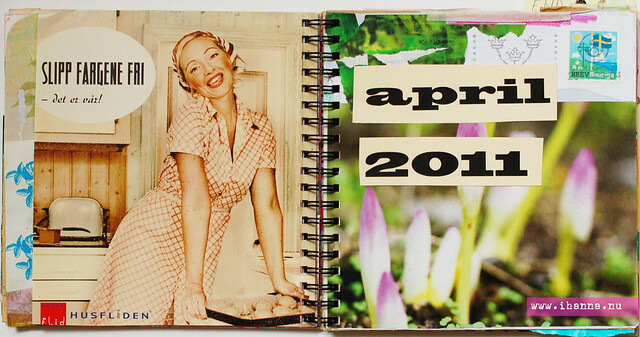 Today is all about my the prettiness of one of my Art Journals! And I’m calling it a Smart Journal. The name is my own invention but mostly just a wordplay. And you know me, I’m a sucker for playing with words. 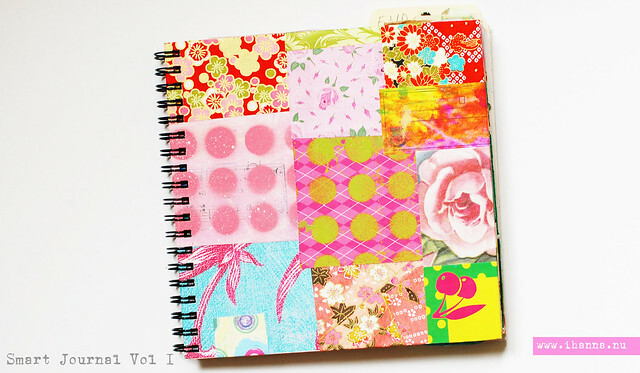 It’s a Small Square Art Journal = Smart! A finished notebook that I fill with a mix of fun papers and spiral bind together. I love to name things and projects. It helps me keep track of what I’m doing and where I am. It gives me direction and intention. This is volume one in a series of new, smaller journals. I think this journal is pretty smart looking, or what do you say? Introduction page stating the size (16x16cm) and name of the journal. Very pretty bird illustrations are included too. The Sphinx torn from a vintage book that I altered into an art journal. This illustration could also have been included in the Travel journal. 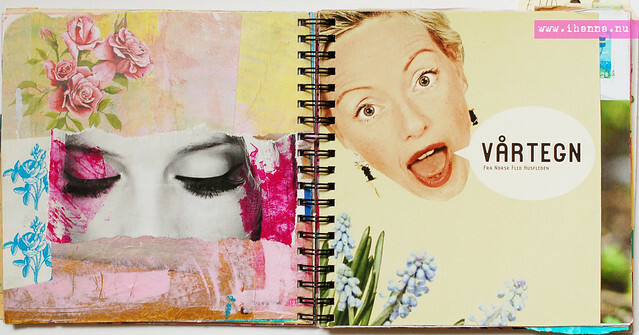 Anything cut out can be glued into an art journal. Here a magazine clipping on how to find energy. A self portrait. Book illustrations. Envelope lining from CSN. 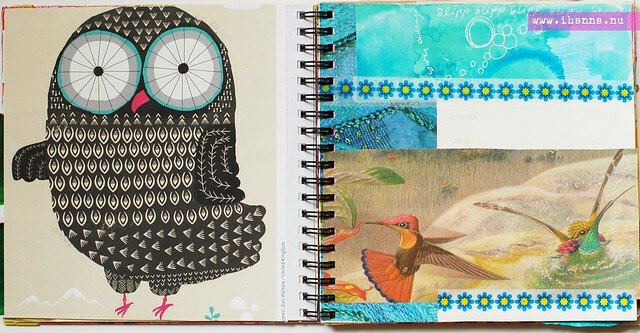 And the patterned paper at the right top – what is that pretty thing? Tea packaging! 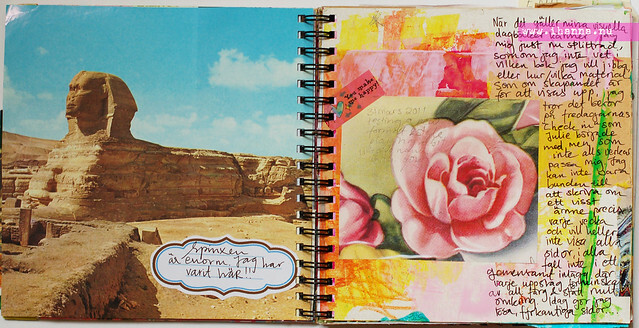 I made a few loose square journal pages back in spring 2011 already, when I wanted to try a new format and to journal “on the loose“. I think it’s fascinating how the format of the pages gives you new challenges and opportunities. There is no way to know how you’ll like it until you’ve made a couple of pages! A feeling of spring! Then – and now. Thanks for all your kind words on my birthday yesterday. I had a lovely day! What journal style are you into right now? 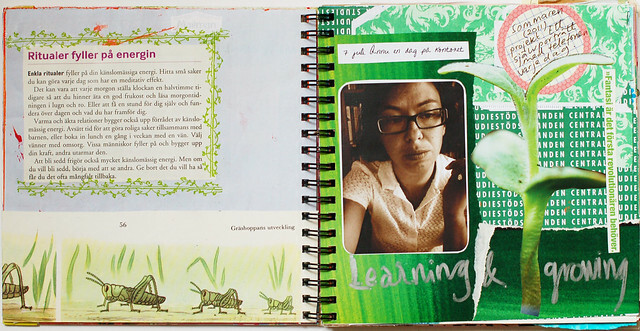 This entry was posted in Art journaling, Bookbinding and tagged hand made journal, smart journal, spiral binding. Bookmark the permalink. Such pretty journals, and so fun to both put together and to fill up! I just love the color and images you choose. I am way into loose-page, evolving journals right now. I have learned a new binding technique in one of Ms. Moss’s classes and feel confident that I can get those loose pages together either with one of your techniques or one of hers or one that I taught myself. It used to be scary to think of putting loose pages together, even though I enjoyed the loose page way of working. I’m blabbing on here, but I hope your birthday was luxurious and fun. And I love your smart journal. I love that green page! and the touches of Scandinavia, always. 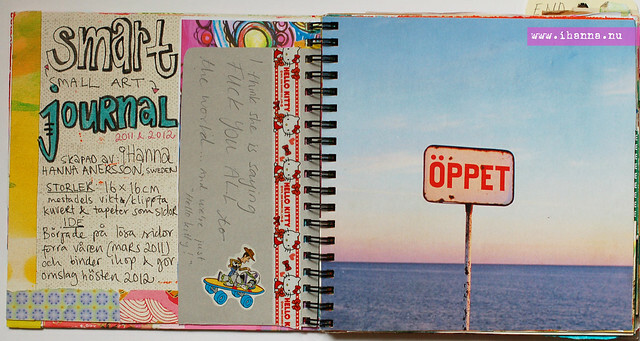 I am really loving small journals at the moment. It is easier for me to finish one that is say 6 pages than one that has 200, To be honest I am finding the a5 Moleskine cahirs too big at the moment and I think they are only about 32 pages, last year they were my favorite. Love your bright colours and simple layouts! And “Happy Birthday” for yesterday!